I have to make it quick and I think we have got all required information. I ain't going to describe source code. You have to help yourself. It has become already too long. I can honestly say that I tried my best. Today I am going to finish this series and it's the last part. So first of all, take a look at calculation part. To identify each bit uniquely, we will use another calculation method. You may use as you want. I ain't going to use millisecond. You can use millisecond or microsecond if you want. If you want to use millisecond to measure pulse, then for logical 0 you get (562us_on+562us_off)=1.124ms. and for logical 1 you get (562us_on+1687us_off)=2.249ms. You know, for each task microcontroller needs time. That's why reading can be varied from calculation. So if you use integer number, you will get 1ms for logical 0 and 2ms for 1. By applying this you may successfully able to make it. Alright. we know that , 1secon means=750000 pulses. Alright. So, 1000ms means=750000 pulses and 1000000us means=750000 pulses. Now, we know 255 pulses means 1 interrupt(timer overflow) or Count=1. So, we can say 6.62 interrupts means logical 1. In coding we I will use 5 or 6 or 7 to identify logical 1 in proteus. So, we can say 3.31 interrupts means logical 0. In coding we I will use 2 or 3 or 4 to identify logical 0 in proteus. By using this technique, from count variable we can identify logical 1 or logical 0. In source code of transmitter , 4 commands are used . Here blue color represents 4bit command and red color represents reverse order of the main 4bit command (blue colored).To avoid noise and to achieve clear signal we need this. Consider that we have main 4bit command 0001.So the reverse command should be 1000 command .Now we have to attach these and that will be 10000001. Finally we get 8bit command in which a main command and a reverse of that command are saved . We will use PWM to generate 36KHz pulse and that's why we will connect positive(+) pin of Transmitter unit Microcontroller's CPP1 pin . Because using that pin of Microcontroller will generate 36KHz pulse . PWM1_Init(36000); will set up the CPP1 pin for PWM . 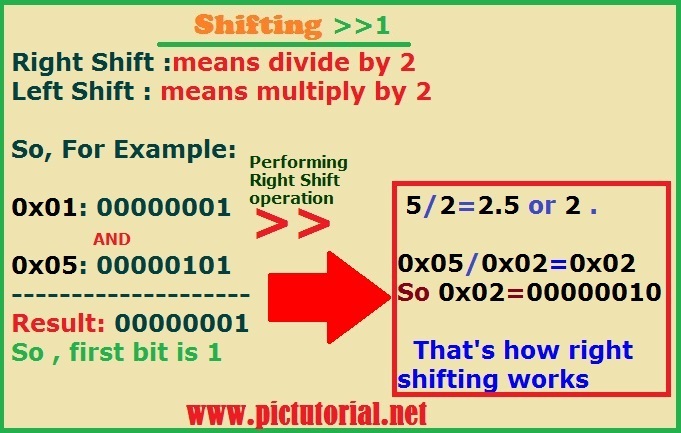 set_duty(127) is used to providing same for both ON and OFF .That means (T/2) time it will ON and (T/2) time it will OFF .If we use set_duty(255) , then total Time period (T) will be remain ON. 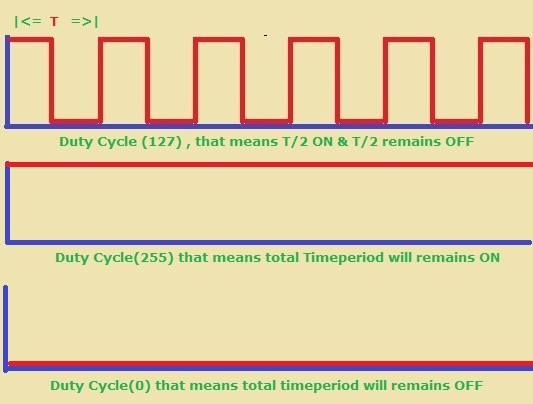 If we use set_duty(0) , then total Time period (T) will be remain OFF. Here in if statement , an AND operation performed between Command and 0x01 . We are using this to identify each bit of data command. Suppose , our command is 10000001 and 0x01=00000001.So ,when an AND operation performs the result will be like this. 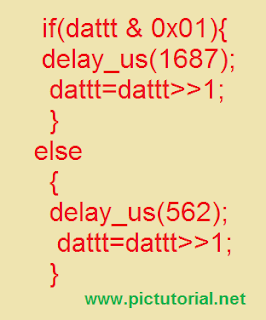 So, if result is 1 ,then the related bit is 1 and delay should be 1687us. So, if result is 0 ,then the related bit is 0 and delay should be 562us. Here this part of code is comparing that Data signal commands received in receiver unit are correct . 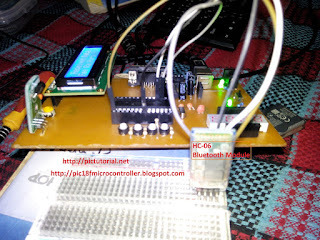 When microcontroller understands about the 4bit command "0001" , consequently it turns ON RB6 pin or First LED . 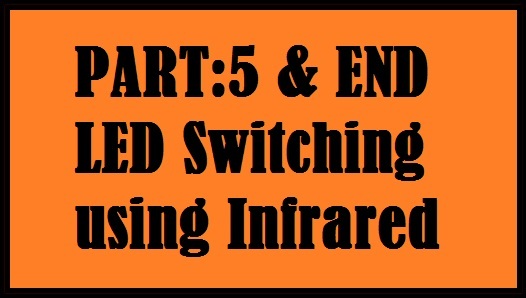 # IR-Controlled LED Switching in Proteus 8. In this series tutorial, I had to work hard and It was really tough. Hope you will be able to make it by yourself. 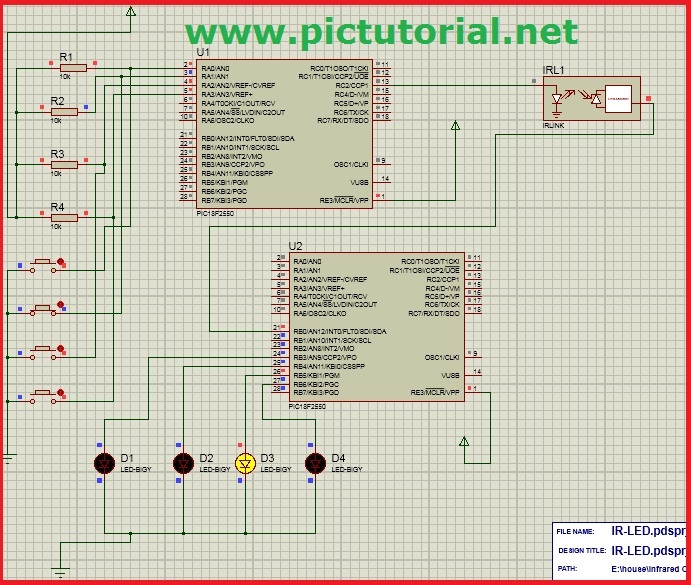 how do i make a pin for speed control as dimmer using triac for ac appliances. Yes you can. This case you need to use PWM pin connected with the gate. If you increase the PWM width the AC current will follow through the triac. I have no practical experience on that case. I will suggest you not to use DIAC between the pin and gate since as far as I know DIAC needs probably bit high voltage to make conduction and Microcontroller pin will provide 3.3 volts or 5 volts(You shlould check through a multimeter to measure pin voltage). Best of luck. It's a late reply since my comment option wasn't working. Suddenly I've found it's working. Anyway thank you for your comment. Can you explain tihs part? 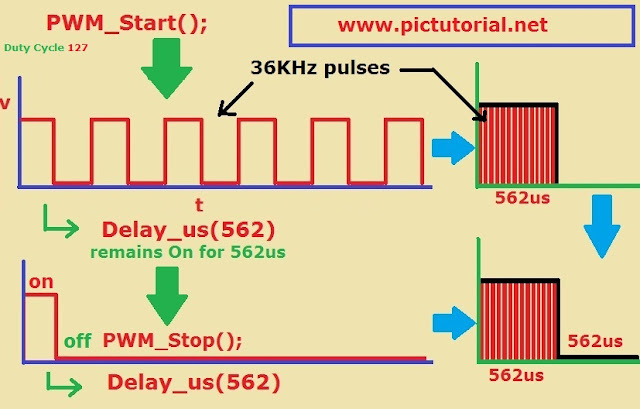 1.PWM1_init(36000); means initializing PWM1 with that frequency. 2. PWM1_Set_Duty(127); making duty cycle 1/2. That means on & have same time duration. 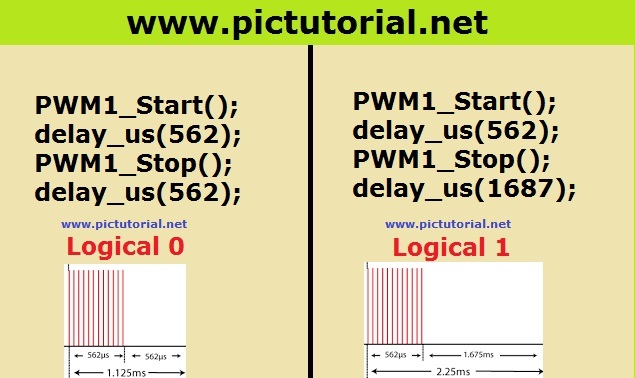 3.PWM1_Start(); starting the PWM1 at the certain pin.